Philadelphia, Pennsylvania – May 5, 2016 – Janney Montgomery Scott LLC (“Janney”), a leading full- service wealth management, financial services and investment banking firm headquartered in Philadelphia, PA, today announced they’ve been ranked by InformationWeek, for the second consecutive year, as an “Elite 100” – a list of the top business technology innovators in the U.S. This is InformationWeek’s 28th year identifying and honoring the nation’s most innovative users of information technology. The InformationWeek “Elite 100” research tracks the technology-based investments, strategies, and results of some of the best-known organizations in the country. Unique among corporate rankings, the InformationWeek “Elite 100” spotlights the power of business technology innovation.The full list can be found on http://www.informationweek.com/elite100. “Being named for a second time to the InformationWeek Elite 100 list is a testament to both the quality of the culture we foster for Janney’s Information Technology team members and the value placed on technology innovation as a contributor to fulfilling enterprise strategies,” said Bob Thielmann, Janney’s Chief Information Officer. “More than half of the list is comprised of Fortune 1000 companies, so we are proud that Janney can compete with and be recognized at the same level as firms which have vastly greater resources,” said Thielmann. 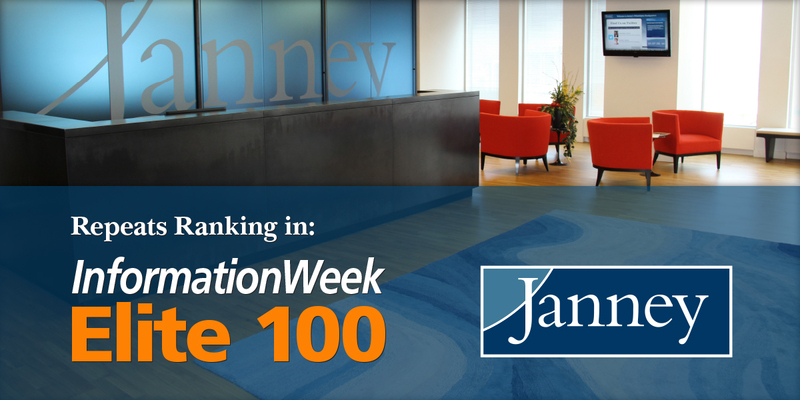 In addition to the InformationWeek Elite 100 ranking in 2016 and 2015, Janney has been recognized for other technology-related awards including: CIO Magazine’s CIO 100 Award, Computerworld’s 100 Best Places to Work in Information Technology, and Computerworld’s Premier 100 IT Leaders. • knowing individual contributions and careers are valued by managers and the firm. All Janney IT managers are also player-coaches - meaning they have a strong expertise in their domain and spend alot of time teaching and pushing their teams to the boundries of technology deployment. “Technology priorities are continually reviewed with senior management with an emphasis on initiatives generating returns and improvement of the client and financial advisor experience. The repeat InformationWeek award substantiates the value of our technology team brings to business strategy compared to hundreds of other firms and is a nice confirmation that we are on the right path,” said Thielmann. For more than 30 years, InformationWeek has provided millions of IT executives worldwide with the insight and perspective they need to leverage the business value of technology. InformationWeek provides CIOs analysis and research through its thriving online community, digital issues, webcasts, proprietary research and live, in-person events. InformationWeek’s award-winning editorial coverage can be found at www.informationweek.com. InformationWeek is produced by UBM Tech.